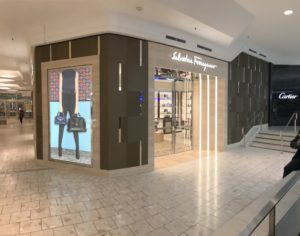 Salvatore Ferragamo, world leader in Italian luxury goods, has recently relocated their store at The Mall At Short Hills. TPG ARCHITECTURE, MICHILLI INC and Zordan s.r.l. sb are the companies who have worked on this project. TPG Architecture was founded 1979. Headquartered in New York City, with a regional office in Long Island, TPG works locally and all over the world with completed projects in over 43 countries. Michilli Inc. for over twenty years, has delivered premium quality and service to over 150 commercial, retail, and residential projects. Zordan, over the years, has built up an international reputation as a partner for high-end interior design projects, from flagship stores to horeca furniture, to private houses.